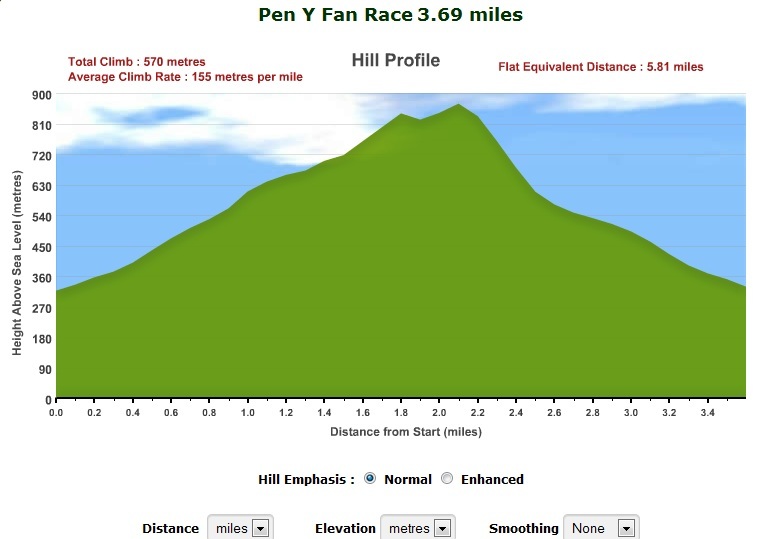 My previous post was a brief preview on the Pen Y Fan race and what it entailed, now its done and dusted how did it go and what are my thoughts? Arriving at the race start the weather was appearing to be in our favour and although there was a substantial amount of low cloud the rain was holding off. Heading over to the registration tent we queued for our race numbers, collecting mine (176) it was also reconfirmed that due to the variable weather conditions all runners were required to carry the mandatory kit; full windproof body cover, compass, whistle and map all in a rucksack or bumbag. Having sold my Inov8 bumbag and not wanting to use my Salomon S-Lab because it’s not waterproof I opted to use my OMM Ultra 15 which might be a bit large size wise but I had taken out the foam padding and compressed it right down. With the 11am start looming I was contemplating my objectives for the race. Last year I completed the run in 1:05:38 which considering it was my first proper fell race wasn’t too bad, but given the record time of 00:30:00 not a winning time and in I finished second to last in 2011. Given how the weather had been I was preparing myself to being slower, remembering how punishing the climb was and how difficult the descent would be. Trying not to dwell on the prospect of finishing worse than last time I waited for the race briefing to be completed and for the starter to kick things off. At 11:05 we were off and immediately the lead runners were off at a pace I can only dream about. I on the other hand was plodding along, Gareth had a good start and was a head of me and increasing his lead. I fell into the pack and ran until the climb started getting steeper and fast walking was the more efficient method of progressing. Eventually crossing the stile the real climb began and the sweat was pouring off me. Gareth had now opened even more gap and I was moving as quickly as I could but keeping pace with those in front of me, with some conciliation taken from the fact that I wasn’t last and had a few people behind me. I am not going to lie, I found the whole uphill section hard going, despite all the running I have been doing the relentless uphill just took the strength of my legs. The year before in preparation we had been on the treadmill with 10kg in a backpack and the incline ramped up, this year I had done none of that and it was showing. I hit the summit in 00:43:06, 16 seconds slower than last year. Already I was slower and I still had the descent to come, which I had already anticipated being slower than last year. Running towards the cairn and following the marshalls instructions to drop to the left I hit the downhill. As you will be able to see from the hill profile at the bottom of the post this descent is steep. With no path to speak of it’s just trying to find a route down on the grass as quickly and safely as possible. I can’t recall how many times I slipped over onto my bum, each time thinking to myself “don’t break your ankle!”. One guy decided that trying to descend on his feet was too much and slid about 50 meters on his bum, overtaking about 4 people as he went. He got up find and carried on, but this is not a technique I was going to adopt. I continued down, aware that I needed to make up time on the climb but knowing there was only so much I could do. 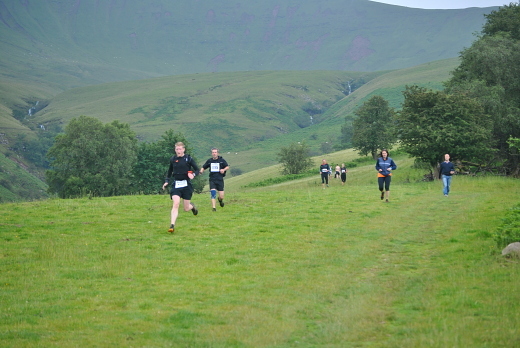 Not being a seasoned fell runner I simply didn’t have the experience or the bravery to go any faster than I did. Eventually it leveled out and it was then a case of navigating through the boggy grass back onto the route we took up. Continuing down I was finally able to break out some speed (you will see on the pacing chart) and actually did some running!! It was here that I managed to re-take some of my lost places on the descent and passed about 3 people on the final sprint finish. Surprisingly I had finished the race in 01:01:55, about 3 minutes 30 seconds quicker which I was utterly surprised at. The descent had been done in about 18 minutes which rather than the 22 minutes the year before. As you can see, its a lot of up and a very very steep down! A chart detailing my speed vs elevation, you can see that its pretty slow until the point the descent levels out and I feel more secure in my footing. As an event the whole thing is great, from the simplicity of signing up on the Brecon Fans website (link at the bottom of the post) to the value for money (who can argue with £4.00). Organisation is really good and the people are all very friendly. I was most pleased with the return of the beer and flapjack at the end of the race. I would say if you are looking to add a fell race to your calendar then this one is a must. First and foremost, I need to train on the descents. I just can’t seem to go as quickly as the other runners, I know I am not going to be as quick as the top end runners (9 minutes anyone!) but if I could shave 4-5 minutes off I would be pleased. Part of me thinks the shoe choice could play a part, but that must only a small one at that, it has to be mainly in technique and confidence. If anyone who reads this post has any suggestions, training or technique then feel free to leave a comment as the advice will be most appreciated.